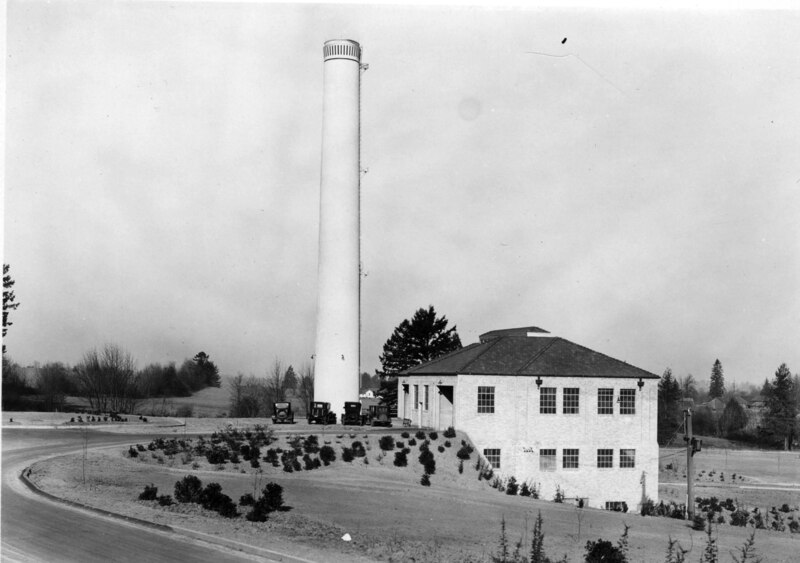 The newly opened city incinerator is shown here in this 1932 photo. Located on N. Columbia Blvd, you can see the overall area in this 1940 aerial photo from an earlier Vintage Portland post. Whew! Sure glad it failed to incinerate the city! I wish the tower still existed. North Portland needs more landmarks to help orient oneself. what was the incinerator originally built to burn? I thought I read somewhere that the city once burned dead animals there. Recycling hadn’t been invented. I would think they just took all the garbage there and burned it. What ever wouldn’t burn probably went into a landfill or was dumped in the Pacific. Yes, the landfill was essentially just across Columbia Boulevard. This is the chimney for which Chimney Park was named. The building still stands and is about to be renovated by Portland Parks and Recreation after serving as their document archives for years. I believe that the City archives were stored in that building for a time.